Now, more than ever before, the need to accurately match the right Internet Connectivity service to your performance, availability, security and budget requirements is of a critical concern. We help you balance these factors and get the right service for the delivery of your applications and data 24x7. 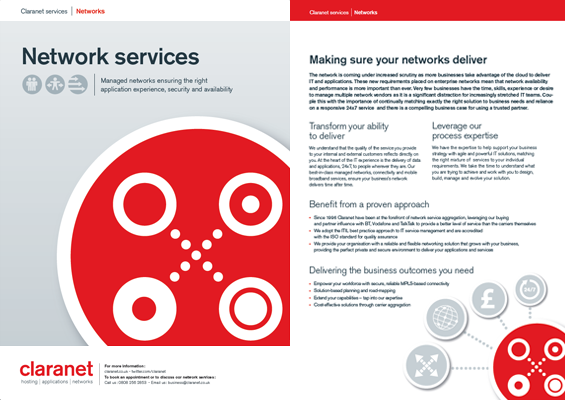 Why choose Claranet for Network services? Working with Claranet removes the burden of project managing and carrying out the installation of your Internet Connectivity services yourself, saving you time. IPv6 was designed to succeed the existing IP addressing system of IPv4. Every device that connects to the Internet requires a unique IP address. Under IPv4 the number of available addresses is running out. IPv6 resolves this issue by using a different addressing method that allows a greater number of addresses. IPv6 is set to become the standard addressing system of the Internet, hence its importance.